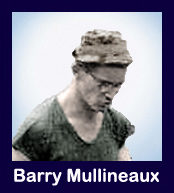 The 35th Infantry Regiment Association salutes our fallen brother, CPT Barry Thomas Mullineaux, who died in the service of his country on May 12th, 1970. The cause of death was listed as Mine. At the time of his death Barry was 26 years of age. He was from Ambler, Pennsylvania. The decorations earned by CPT Barry Thomas Mullineaux include: the Combat Infantryman Badge, the Parachute Badge, the Silver Star, the Bronze Star, the Purple Heart, the National Defense Service Medal, the Vietnam Service Medal, the Vietnam Campaign Medal and the Vietnam Cross of Gallantry with Palm Unit Citation. Buried at Holy Sepulchre Cemetery Cheltenham,PA. Captain Mullineaux died commanding B, 5/7 Cav, 1st Cav Division during Cambodian Incursion.. During his first tour, he was a well-respected platoon leader with B, 1/35th. He was awarded a BS w/3 OLC posthumously. Photo contributed by Howard Johnson. This is the day I first met you at Fort Benning Georgia. We began Officer Candidate School(84th CO. O.C.S. )a week later. As we toiled through the hard day's and nights and learned to handle the harassment we became buddies. Maybe because we were both from the same part of the country (you from Ambler PA and me from Philly)or probably because you were just a cool guy. Somehow we found time to form a singing group with Big Jack McCarthy and Mr. Everett. We were part of a show that celebrated our making it thru the first 11 weeks of O.C.S. At our 18th week we celebrated again with a few more rebel rousing ballads. Unbelievably we made it thru and graduated on March 13, 1967 as 2nd Lieutenants in the United States Army Infantry. Since you flew home with someone close to you, you asked me to drive your 58 Ford home to Philly. You know, the one with the big 4 barrel carburetor. We met up a few days after we got home and you took your car, duffel bag, awol bag and other paraphernalia. We wished each other good luck, had a drink and said goodbye. Knowing we would see each other again, perhaps after the war. Three years later I read in the Philadelphia newspaper that you were K.I.A.leading your company as you served our country. A bright light in my heart went out that day. I have always wanted to find your family and talk to them but I never followed thru. Barry, I think of you every day and say a prayer as I raise up and salute our flag. Miss you buddy. Posted by: Bill Monaghan 25th Infantry '68 VN. For gallantry in action while engaged in military operations involving conflict with an armed hostile force in the Republic of Cambodia. Captain Mullineaux distinguished himself by exceptionally valorous actions on 12 May 1970 while serving as Company Commander of B, 5/7th Calvary. While in the process of forming a night defensive position, the unit came under intense rocket and small arms attack. Unhesitatingly, Captain Mullineaux moved to the heaviest point of contact, rallying his men, directing counter-fire, and placing his men in position where they could most effectively engage the hostiles. During the battle, he led a small group of men as they attacked and overran a segment of the enemy force. His gallant action was in keeping with the highest traditions of the military service and reflects great credit upon himself, his unit, and the United States Army.